Harder foods, like raw vegetables, meat, and fruit, should be cut up into smaller pieces before consumption. You should also avoid biting into them with your front teeth. Although it may not always be possible, it is best to stick to softer foods, like bananas, yogurt, and mashed potatoes while you have braces on. 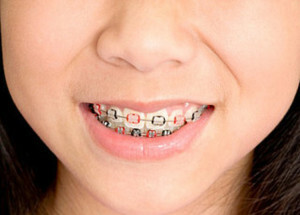 In addition to watching what you eat while you have braces, you should also make taking care of your braces a priority. If you aren’t careful, food and plaque can build up in the crevices of your braces and may end up causing stained enamel and tooth decay. After every meal, look in the mirror to make sure that any pieces of food aren’t stuck in your braces. Then, brush and floss your teeth, paying special attention to the areas around the brackets and wires. If you have any questions about what foods you shouldn’t eat or how to properly care for your braces, our dentist, Dr. Anna Szmitko, can provide you with more information.